A condition called amyloid angiopathy is often associated with stroke. Amyloid angiopathy is the accumulation of protein fragments in blood vessels. Typically, the presence of amyloid in the brain is associated with Alzheimer's disease, Parkinson's disease and several types of dementia. However, the amyloid buildup in the brain can also affect the blood vessels, making them fragile and more likely to bleed. This results in bleeding in the brain, which is often referred to as hemorrhagic stroke or intracerebral hemorrhage. The symptoms of amyloid angiopathy vary depending on which blood vessels bleed and how much the fragile blood vessels bleed. When there is a small amount of bleeding, there may be no symptoms at all. If recurrent bleeding episodes occur, symptoms may begin to become noticeable. In some cases, the symptoms can be vague, causing a progressive loss of memory or a mild deficit in brain function, such as blurry vision. When there is a large area of bleeding, this may cause major neurological symptoms that include hemiparesis, hemiplegia, loss of consciousness, and seizures. The risk factors for developing amyloid angiopathy are not completely understood by the medical community at this time. The only clear risk factor appears to be age, as amyloid deposits are more commonly found in people who are older than 55 than they are in younger people. There seems to be a hereditary association with amyloid angiopathy, but people can develop amyloid angiopathy without a family history of the condition. Amyloid deposits may accumulate inside the walls of blood vessels in the brain. This is referred to as amyloid angiopathy. The accumulation of amyloid may cause blood vessels to deteriorate over time until they eventually break down and bleed. Amyloid has also been associated with inflammation, which is the body's way of dealing with any injury or infection. Inflammation, especially unnecessary or excessive inflammation, is associated with stroke. Typically, bleeding caused by amyloid angiopathy is very small, affecting tiny blood vessels. The small areas of bleeding are called petechial hemorrhages, and they have a characteristic appearance on Brain CT or Brain MRI scans. One of the hallmarks of intracerebral hemorrhage (bleeding in the brain) caused by amyloid angiopathy, is that it occurs typically in areas near the surface of the brain, in a distribution typically referred to as “lobar." Amyloid angiopathy can also lead to a large area of bleeding in the brain, which can be life-threatening. The most reliable method used to diagnose amyloid angiopathy is a brain biopsy, which is not a practical procedure. A brain biopsy is a surgical procedure that carries a risk of bleeding and/or infection. Therefore, biopsies are not performed unless they are absolutely necessary. Your doctor can use a form of MRI called "the gradient echo" (GRE) to obtain some clues that can help decipher whether you may have amyloid angiopathy. This is an efficient test that detects bleeding in the brain. GRE can identify large or small areas of bleeding that took place hours or years before the test. The characteristic appearance of amyloid angiopathy on GRE is commonly referred to as “cortical cerebral microbleeding." Once bleeding in the brain has occurred, the treatment of intracerebral hemorrhage due to amyloid angiopathy is no different from the treatment of intracerebral hemorrhage due to any other cause. 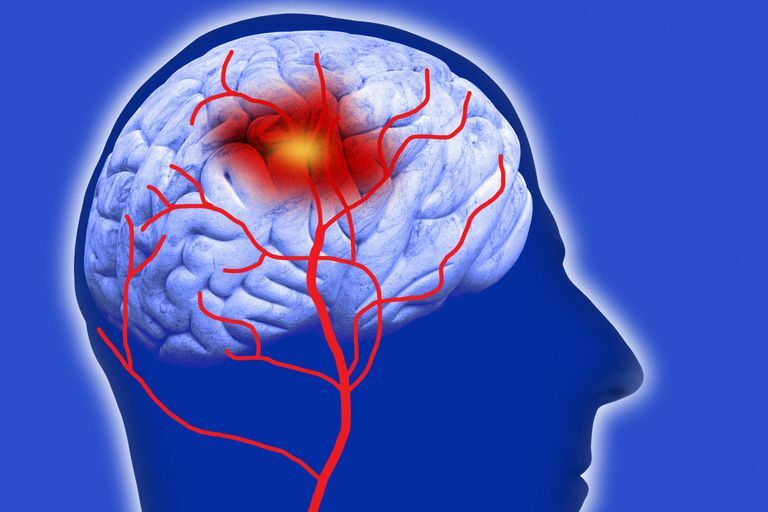 First, if bleeding causes increased intracerebral pressure (ICP), from swelling or mass effect, your stroke care team may need to perform emergency surgery or implement other measures to relieve the pressure from the swelling. Your medical team may also give you antiseizure medicines in order to prevent seizures, which may be triggered by bleeding in the brain. At the present time, there is little that can be done to reverse the process of amyloid protein deposition. If you have been diagnosed with this disorder, you should maintain normal blood pressure and avoid blood thinners, such as aspirin or Plavix, as these can increase the risk of bleeding in the brain. Can Your Lupus Cause a Stroke?